If for some reason you would like to hide certain applications running in your Windows system, then this tiny utility should be the right tool that you can consider. 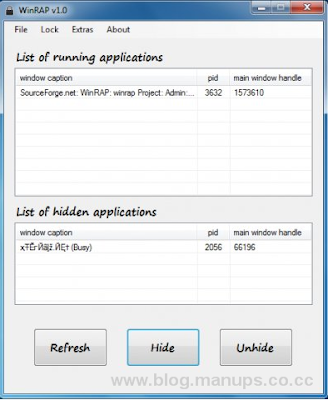 Named as WinRAP v1.0 (Windows Running Applications Protector), it allows users to instantly hide any running programs to prevent them from being seen by unauthorized third parties. Once download the utility, without the need to install it, users can directly execute the program for immediate use. After it has been successfully launched, the utility will display all the running applications instantly and users can selectively highlight on specific running applications and just followed by a ‘Hide’ button click, the applications will disappear from your screen. Similarly, a click on ‘Unhide’ button will bring them back to its original state, allowing all users to view it like normal way. Not to worry about if you have multiple hidden applications but unable to recall them all, the utility will list them down under ‘List of hidden applications’ so that you are aware of which one is still running silently in background consuming some of your CPU cycles. Besides, it allows users to set password (default is 1234) to access to all the configuration such as to ‘Unhide All When Closing’, ‘Disable Task Manager When Locking’ and many more as well as Hotkeys to unlock stealth mode locking and etc. Some other bonuses include Hide Desktop Icons, Hide/Unhide all that make it a tiny but yet useful tool for those that are looking for way to make running programs invisible especially when trying to share desktop screen for discussion.